Here's another historic house for your to-visit list. 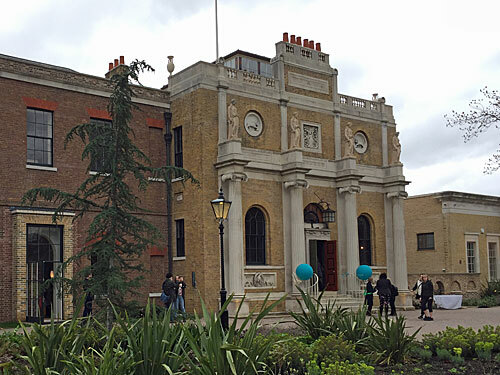 Pitzhanger Manor in Ealing reopened yesterday following a lengthy and significant makeover. Plans were first mooted in 2008, the lottery cash arrived in 2012 and doors closed in 2015. It's taken a year longer than expected, but the end result is a smart restoration offering insight into the work of one of London's favourite architects. Sir John Soane designed the Bank of England, Dulwich Picture Gallery and the previous House of Lords, invariably in neo-classical style. 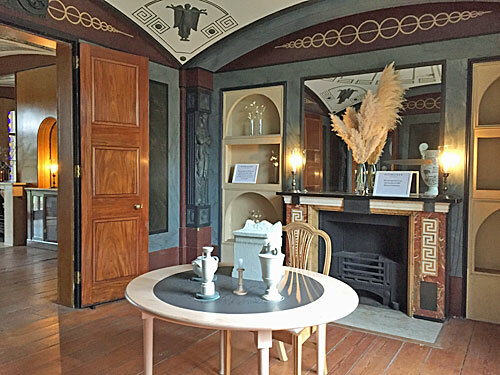 He's perhaps best known for the eclectic museum in his townhouse on Lincoln's Inn Fields, but in 1800 he also fancied a country pad so turned his sights on Ealing. Here amid the fields he built a family home featuring many of his favourite architectural quirks, including curved ceilings and inset mirrors, and named it Pitzhanger Manor House. The family stayed only six years before moving on, and for most of its life the house has been in the hands of Ealing Council. It spent a long time as a library, then an art gallery was tacked onto one side and more recently it proved ideal for weddings. Visitors were allowed inside for free before the makeover, with less to see, but the added wow now requires an entry fee. That's £4.50 for Ealing residents, except on Tuesday and Sunday mornings when it'll be free, and £7 for everyone else. That's apart from opening weekend when everyone gets in for nothing, or so they said. Saturday was busy, with ribbon-cutting at ten and a host of family-friendly activities throughout. Free tickets also sold out in advance, not that it was obvious pre-booking was a good idea, so hundreds of mostly-Ealingers turned up and were disappointed. A stash of walk-up slots was available, but they swiftly vanished too, and basically I had to blag my way inside. One member of staff said sorry no, another said there's only one of you I'm sure we could probably, and the inconsistency of it all didn't please everyone. Here's what a BBC news editor tweeted ten minutes later. The house has, as I remembered, an impressive interior. 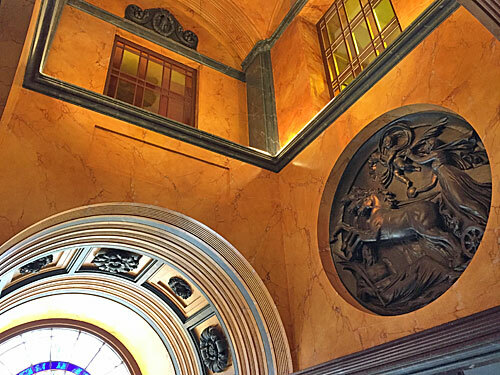 The hallway is narrow with classical decoration and lit by an elongated skylight. The wood-panelled breakfast room has a gorgeous concave skyscape on its ceiling, peering down like a cloudy eyeball, while the library ceiling nextdoor is more trellisy. The conservatory at the rear is new, or at least newly restored, and brightly verdant. Come on a quieter day and it'll be easier to flick through the large 'books' which provide a text-based explanation of what it is you're seeing. I was convinced that the Eating Room in the south wing used to be much larger, and indeed it was, a non-Soane extension having been removed during the restoration. 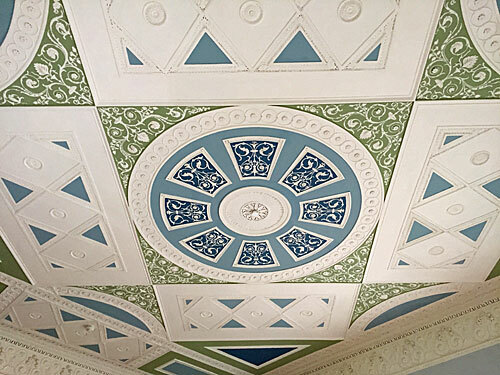 What remains looks splendid, especially (again) the ceiling, but the reduced size intriguingly means the house is no longer suitable for weddings. Upstairs the chief draw is the drawing room with its handmade Chinese bird-and-flower wallpaper, although not best seen on opening day when packed out by parents and babies enthralled by a visiting harpist. Here the house is the star, so there's not a great deal in the way of accoutrements or authentic furniture. To see Sir John's eclectic collection of classical objects, once partially housed here, Holborn's still the place to go. 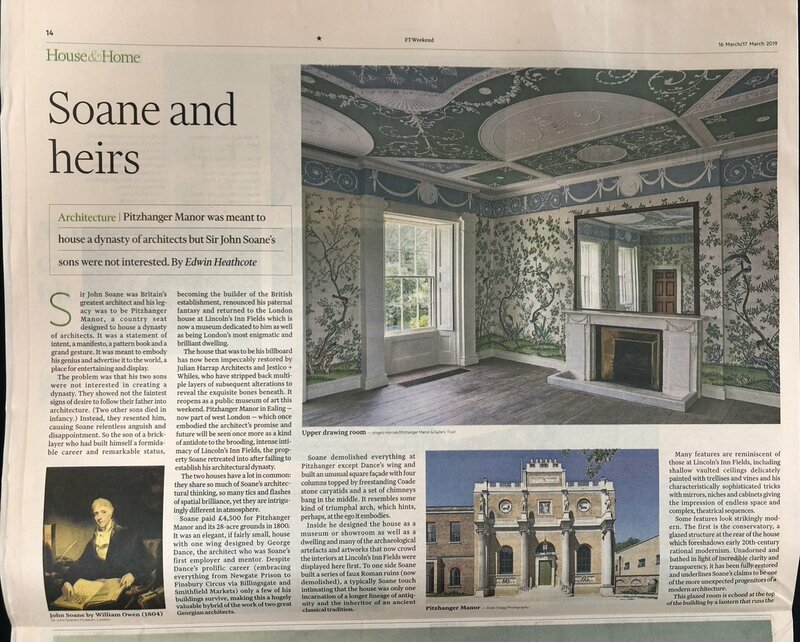 If some of the wooden walls look a bit artificial that's because they're meant to be - in Soane's day it was cheaper to paint on a timber effect than source the real thing. Don't rush through, and make sure you read every brief display panel else you might leave knowing little more than when you went in. A short external colonnade joins the main house to the art gallery, via the information desk and the obligatory gift shop. 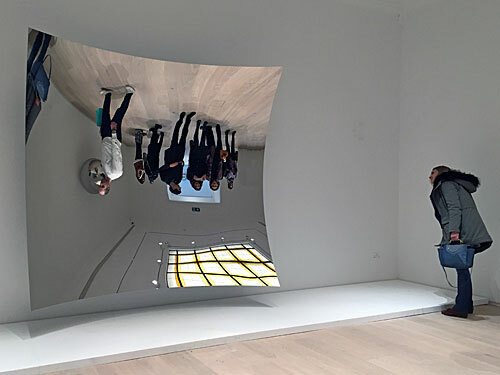 The curators have chosen carefully for their opening exhibition and plumped for Anish Kapoor, with a handful of his playful mirrored conceptions arrayed around the walls. 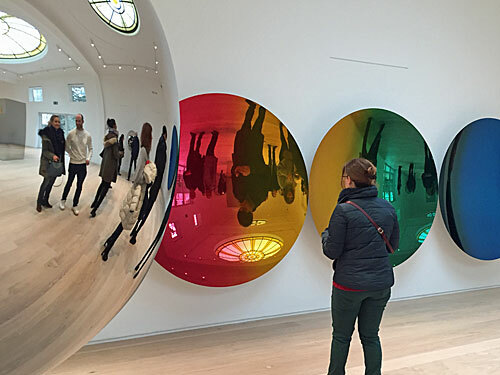 That means ingeniously coloured discs, protruding spheres with holes in and of course his trademark concave glass that makes it look like everyone's upside down. On one level it's just a fairground attraction writ large, but in a selfie-obsessed age also utterly contemporary. I'm not sure I'd have paid seven pounds just for the house, nor for just for the art, but the two together form an entirely worthy proposition. As it is I paid for neither, which you might just sneak tomorrow but I wouldn't recommend travelling far just in case. I was impressed by the crowds on Ealing Green this weekend, but the true test for Pitzhanger comes on Tuesday when an entrance fee is imposed. It's one thing hoping locals take the building to their hearts, but encouraging sufficient daytrippers from further afield may be a tougher proposition.